Is This Really What America’s Clamoring For? 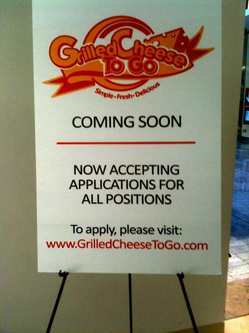 While in the mall I spied this sign for a new store on its way to fill empty stomachs everywhere–Grilled Cheese To Go! I am not making this up. I went to the mall with Helaine and Stef on a shopping expedition. I wish it wasn’t, but clothes buying is always a painful experience for me. I don’t know why? Stef and Helaine try their best to make me presentable. I grateful for that even if it isn’t obvious in real time. Seriously, did someone do research and find grilled cheese sandwiches were a little too difficult for 21st Century Americans to make on their own? I will be curious to see how this fares. Undoubtedly I’ll be wrong and it will be an immense hit. There used to be a restaurant (and I use that term *very* loosely) at the Buckland Hills Mall called J.B. Mack – Macaroni and Cheese Kitchen. According to their Web site, it’s now closed, but they are moving somewhere else in Manchester. I think your Grilled Cheese To Go is J.B. Mack’s Cousin Skippy. In Terminal A of the Detroit airport there is a place that only does peanut butter sandwiches. They make their own peanut/cashew butter and serve it with a variety of jams, fruits or marshmallows on amazing homemade bread. And they put it all in a brown paper bag to take away. 🙂 Best. Airport. Food. EVAR. Just come to Southeastern Connecticut. We already a similar place. Bleu Squid in the Old Mystick Village is a grilled cheese cafe. Awesome combinations, some intriguing ones too!